I have probably waxed poetic about the beauty of Ranch 99 before. Ranch 99 is a chain of Asian supermarkets found in the Bay Area (and I’ve heard rumors of them existing in other parts of California as well). Right down the street from us is the Ranch 99 Cupertino store. It is in a busy shopping center with one of the most dangerous parking lots I’ve ever encountered along with a large number of mostly Chinese restaurants and bubble tea stores. I like having this grocery store within walking distance and it will be one of the few things that I will miss after we move back to Santa Cruz. 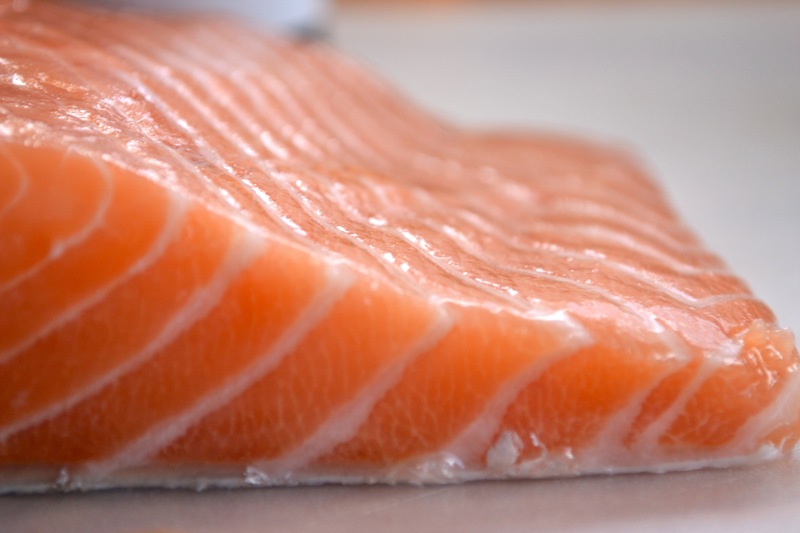 Fresh wild salmon filet with large ribbons of fat running through it. One of the best things about Ranch 99 is the fresh seafood. They have live shellfish of all shapes, sizes, and varieties there. They also have live fish there that you can choose from. Now I am not so knowledgeable, skilled, or adventurous enough at the moment to choose my own fish and gut it at home. Instead Andrew and I opted to purchase their fresh, wild salmon filets stored on ice in the fish market. These filets were huge and mine alone was over a pound of brightly colored, fat ribboned salmon glory. 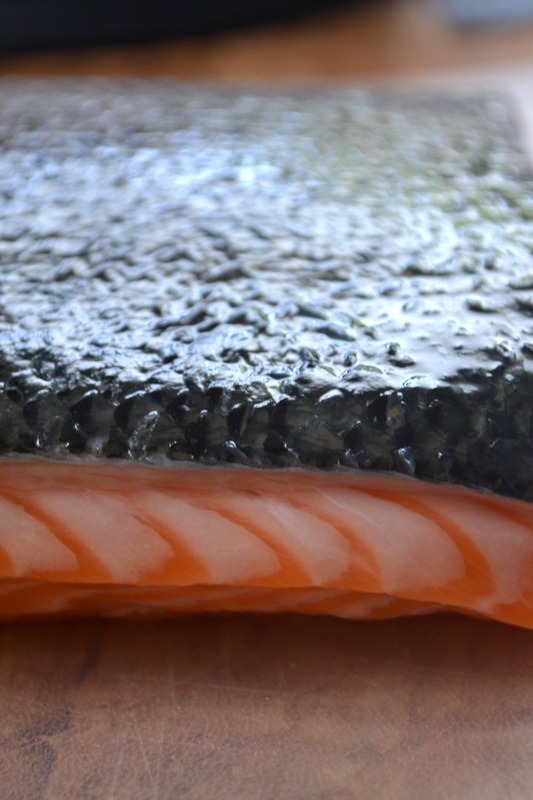 Salmon Skin is not only beautiful but incredibly delicious and crispy when grilled. I went for a simple treatment of the fish. I marinated it in the juice of one lemon, two tablespoons of soy sauce, and rubbed some brown sugar into the flesh. Before marinating make sure to wash the fish so any slime comes off and pat it dry with paper towels. This is also a good time to debone the fish if there are any. There were so few bones in my fish that I just skipped this step all together. Let it marinate on the counter for thirty minutes before throwing it on the grill. 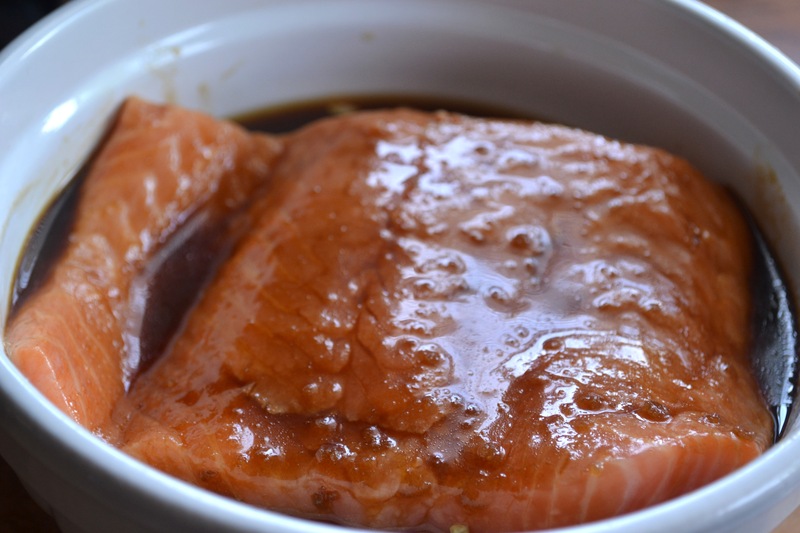 Marinating salmon in soy sauce, lemon juice, and brown sugar. 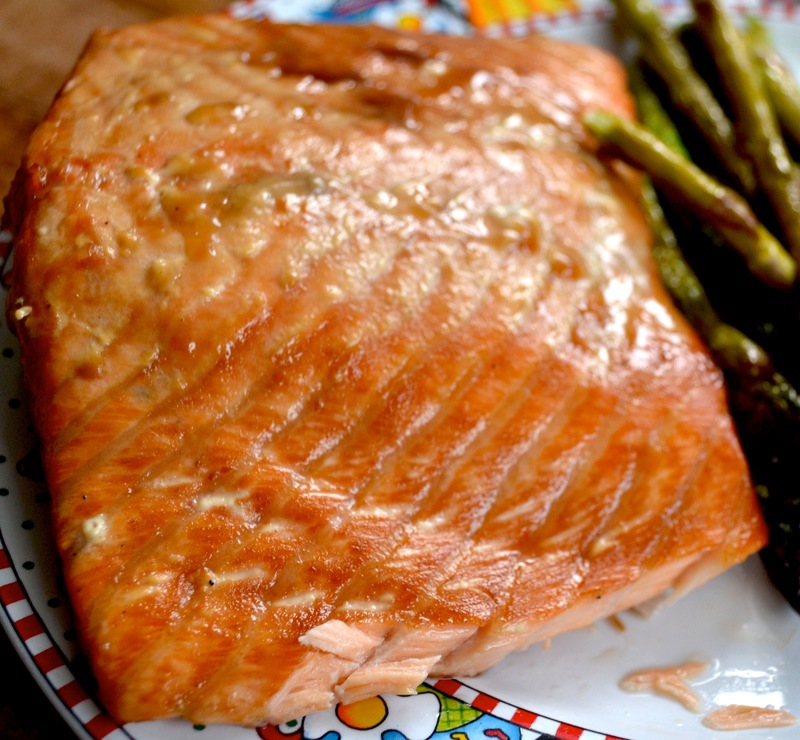 Grill the salmon skin side down so the skin becomes crispy and delicious. The skin may stick to the grill. It did in my case because of the marinade that we put on it, but Andrew’s simple treatment of olive oil and lemon juice did not stick to the grill. You want to grill it on medium high heat with about four inches of space from your rack to your heat source (we use a propane grill). Our filets were large so it took about twenty minutes for them to cook to about medium. It will be less time if your filets are thinner or if you want to go for medium rare. Only eat medium rare or rare fish if it is very very fresh and you know the source. Just because the grocery store says it is sushi grade does not necessarily mean that you can it rare. 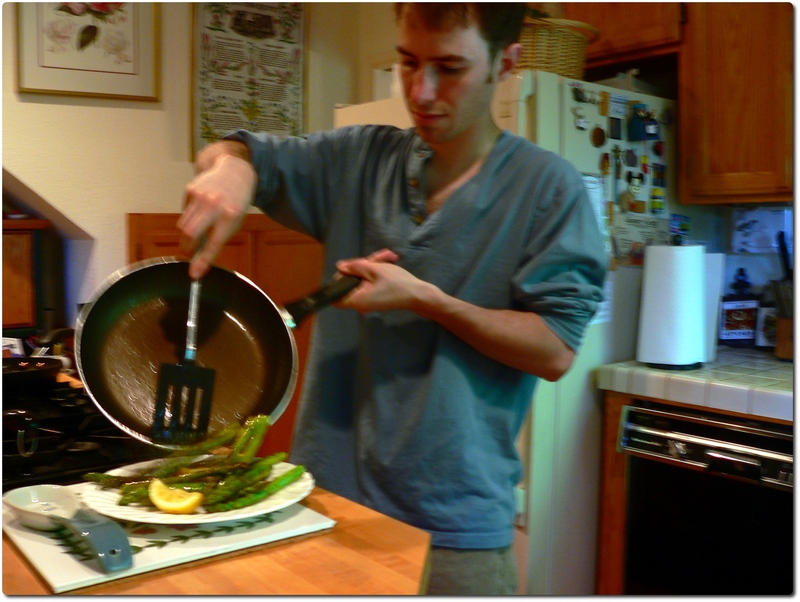 We served the salmon with asparagus cooked on the stovetop with olive oil and lemon and brown rice. I had two chicken breasts to use up that were sitting in the fridge. I was thinking all day about what I wanted to make. I really wanted to make fried chicken and waffles, but I prefer not to fry foods and delicious waffles elude me. I wanted to work on my waffle making, but I also didn’t want to mess them up again. Instead, I decided to make chicken and buttermilk biscuits. 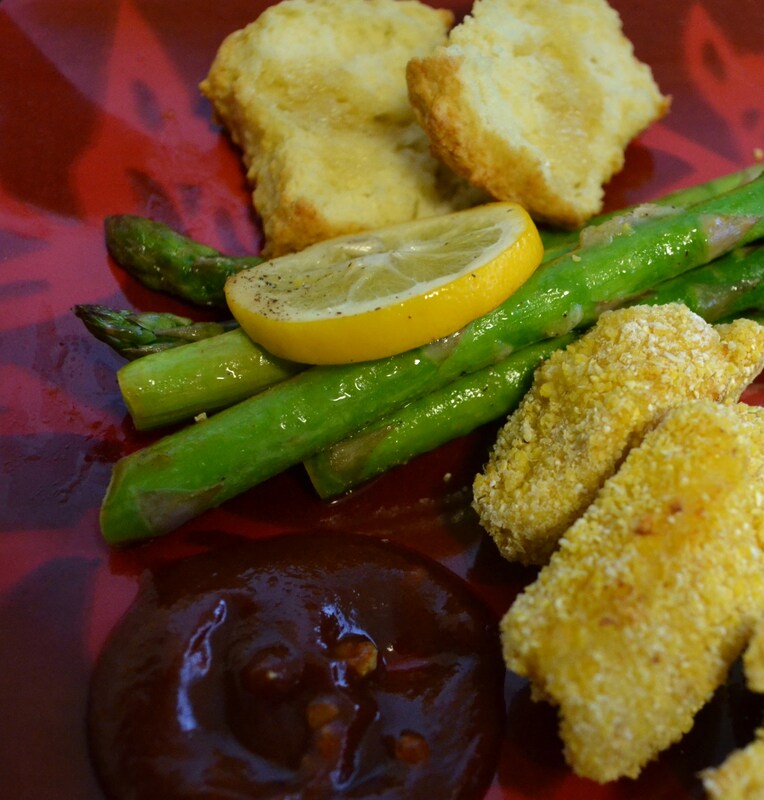 The chicken I made was chicken nuggets from Mark Bittman’s How To Cook Everything. His are fried and I decided I wanted to bake mine instead. Mine turned out dry and definitely needed BBQ sauce. I am terrible at making rice without a rice maker. I can never seem to get the texture correct. The outside is mushy and the inside is undercooked. I always do the right proportion of water to rice, I cook it the amount of time that the recipe says, yet I am a failure at making rice. However, the rice is not inedible so I will end up eating at least one serving of it and throwing the rest out. This week I made brown rice with a broth, blanched asparagus, and a poached egg. 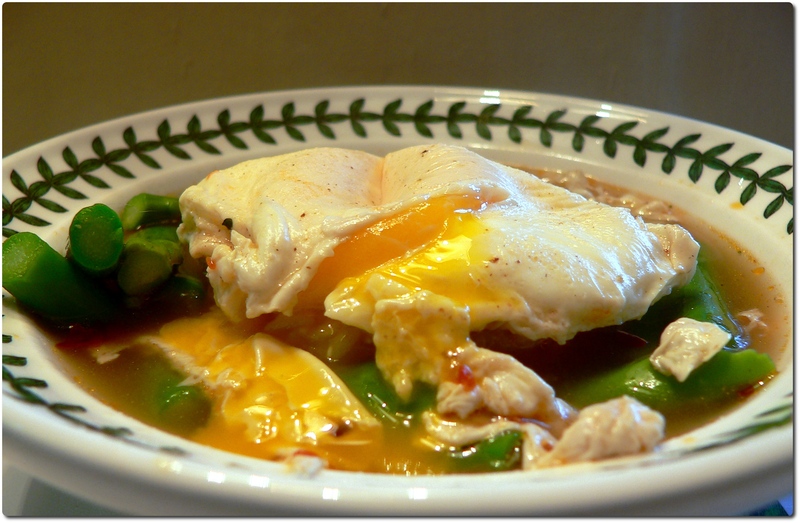 The egg, broth, and asparagus came out nicely. I will have to keep working on my rice cooking skills. Note: I made this broth on the fly and I didn’t measure anything. It definitely came out with an Asian influenced flavor. 1. Boil water and add chicken broth powder. Stir in the rest of spices and nutritional yeast. Once boiling, bring down to a simmer. Crack egg into broth. Do not disrupt the egg at this point. You want to keep your white and yolk whole. Note: To make sure an egg is fresh fill a cup with cold water. Add the egg to the cup. If the egg floats then the egg is bad. If it sinks to the bottom it is still good to use. 2. Remove the egg from the broth with a slotted spoon once the white has set and the yolk gives but is slightly firm to the touch. If you prefer a harder yolk then let it cook for longer. Put this aside with your rice. 3. Add chopped asparagus to the broth and cook briefly. Put in a cup of cold water to cool it down and stop the cooking the process. This is one of those things that I keep checking for doneness. I like my asparagus still fairly crisp, but not bitter the way raw asparagus can be. 4. Place rice in a bowl, top with poached egg, pour broth over egg and rice. Then add the asparagus. Enjoy! Growing up I hated green beans. In fact, growing up I disliked most vegetables and a lot of other things. The problem was I was a kid and my mother couldn’t cook. If your parent doesn’t know how to cook vegetables (or anything else, sorry Mom!) then you don’t grow up loving your veggies. There are vegetables I’ve always loved for sure: peas, carrots, brocolli, and lettuce. There are others that I’ve grown to like over the years that I didn’t like as a kid: brussel’s sprouts, cabbage, and onions. There were others that I never tried as a kid and was able to try as an adult: beets, asparagus, parsnips, bok choy, and other leafy greens. There are still more vegetables that I have tried again as an adult that I will never enjoy: celery, tomatoes, zucchini, and cucumbers. 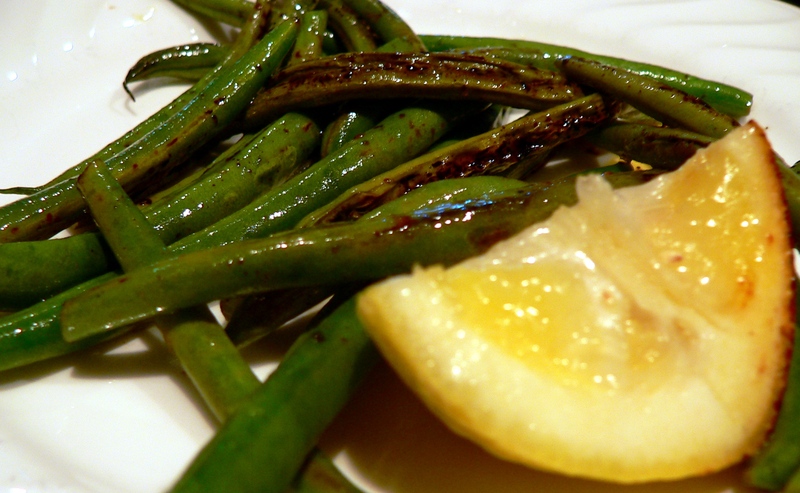 One vegetable that I thought I would never like is green beans. I thought green beans were awful growing up and as an adult I still didn’t like them. The thing was, I always had them canned or frozen. They almost always tasted like sand to me. It wasn’t until today that I learned that green beans can taste delicious and this is all thanks to Andrew. Now Andrew and I manage to cook fairly well together. Or I manage to cook and Andrew cleans up for me and does prep work. I’ve been able to teach him how to make pizza dough, chicken and rice soup, noodle soup, and a couple other things. We work well as a team in the kitchen. Today Andrew was able to show me how he makes asparagus and green beans. They turned out delicious. Really delicious. One of the best vegetable experiences ever. Seriously, I will be eating more vegetables now that I know how to do this. 1. Prep your vegetables. This means snapping the woody stem part of the asparagus off. I bend the asparagus and wherever it snaps naturally is where I snap it. For the green beans I cut the stem end off each green bean. 2. Heat your skillet with oil to medium. Add vegetables and generous amounts of lemon juice. Cook until vegetables are brown, crispy, and tender. 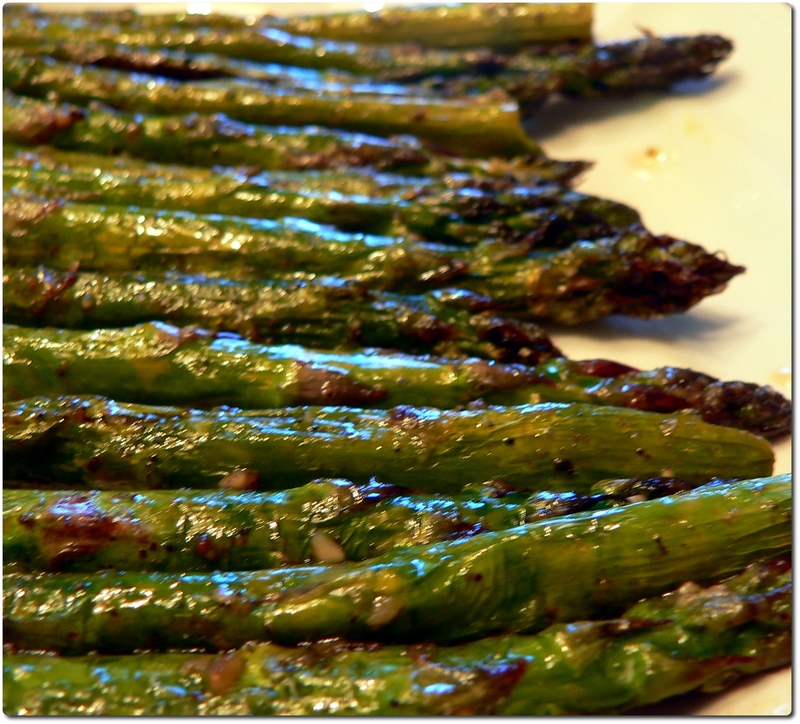 Large asparagus generally takes about fifteen minutes and green beans take less time than this so cook them separately. Last weekend I got the Veganomicon at Urban Outfitters for less than ten dollars. This book runs retail at around thirty dollars, so I was stoked to find it for so cheap. The binding and cover was a little damaged and there was some strange purple ink going on inside the book, but I don’t care: it’s a cookbook, it will get banged up around the kitchen. It’s been inspiring to read all the recipes. One of the recipes that I was most interested in when I first saw the book was the chickpea cutlet recipe. One of the most difficult things about being vegetarian/vegan is finding meat substitutes. I’m sure that the need to have something meaty wears off as time goes by but I’ve only been doing this for a couple months so that desire is still there. I’ve tried tofu, seitan, TVP, and tempeh. I only like tofu and tempeh fried which isn’t the best thing for you. Plus unfermented soy is not good for the digestive system. I only like TVP when it comes pre-packaged as ground beef, but when I make it tastes like salty corn flakes: disgusting. 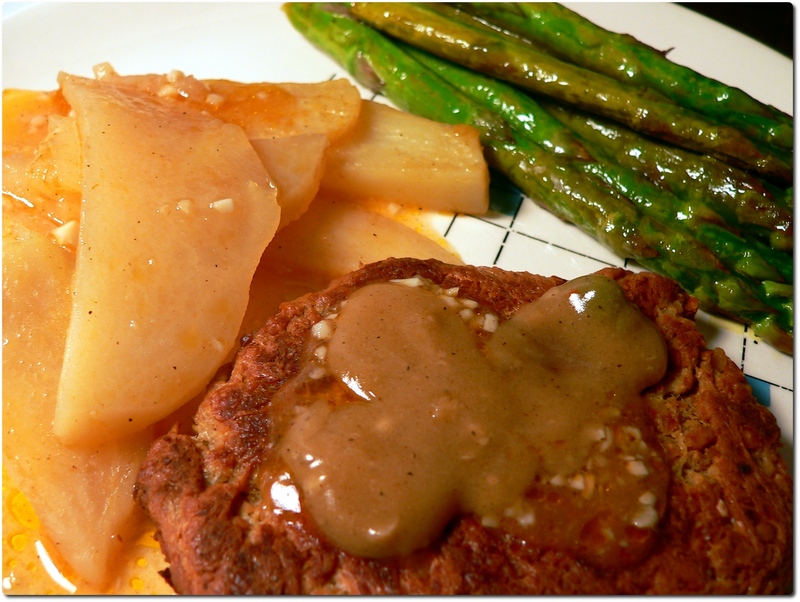 Seitan is good but it takes a while to make and that much gluten is not good for your digestive tract. The chickpea cutlet is a mixture of mashed chickpeas, vital wheat gluten (what makes your seitan and the stuff that makes your bread chewy), bread crumbs, etc. 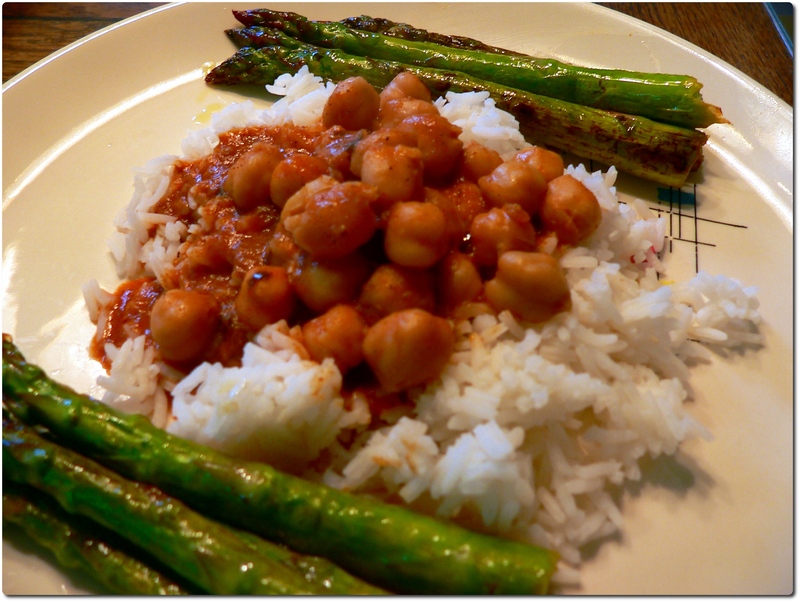 I liked the idea of getting good protein from beans and the chewiness of wheat gluten. The chickpea cutlets were simple to make and they came out amazing. I was completely surprised by how chewy, savory, and “meaty” they were. I even made some at my boyfriend’s parent’s house and they tried them and enjoyed them. They’re definitely big meat eaters and they enjoyed the meatiness of the cutlet. Andrew also liked them which is saying a lot since he’s a super picky eater. I was very pleased with the results. One thing I do not recommend is re-heating these babies. They came out tasting like those frozen vegetarian fake meat products. It was gross, I couldn’t finish eating it. However, when they are fresh they are fantastic and would definitely impress veggies and meat eaters across the board. They however, are not for those who have to be gluten free unfortunately. Sorry guys, my body is fine with the gluten. Note: The original recipe also called for 1/2 teaspoon Hungarian paprika, 1/4 teaspoon dried rubbed sage, and 1/2 lemon zest, but I did not have these things on hand. I also made this recipe with 1/4 cup water instead of vegetable broth and Italian seasoned bread crumbs instead of plain bread crumbs. I am eventually going to try this with different seasonings and types of beans. 1. Pre-heat an oven to 375° F. In a mixing bowl, mash the chickpeas together with oil until no whole chickpeas are left. The first time I did this I used a food processor for this step. It goes much quicker and you come up with a less chunky “batter”. However, the second time I made it I just used my hands and a fork and it came out fine. Add the remaining ingredients and knead for about 3 minutes, until strings of gluten have formed. 2. Divide dough into four equal pieces. Knead each piece in your hand for a few moments and then flatten and stretch each into rectangle. Mine were not perfectly rectangular. Meat is not perfectly rectangular so why should other sources of protein come in funky shapes? I don’t like meat shapes. Once they are shaped stretch them so they are about 1/2 inch thick. 3. Brush each side of cutlet with olive oil. Then place on a non-stick baking sheet. Bake for twenty minutes then flip them over and bake for another 8-10 minutes. 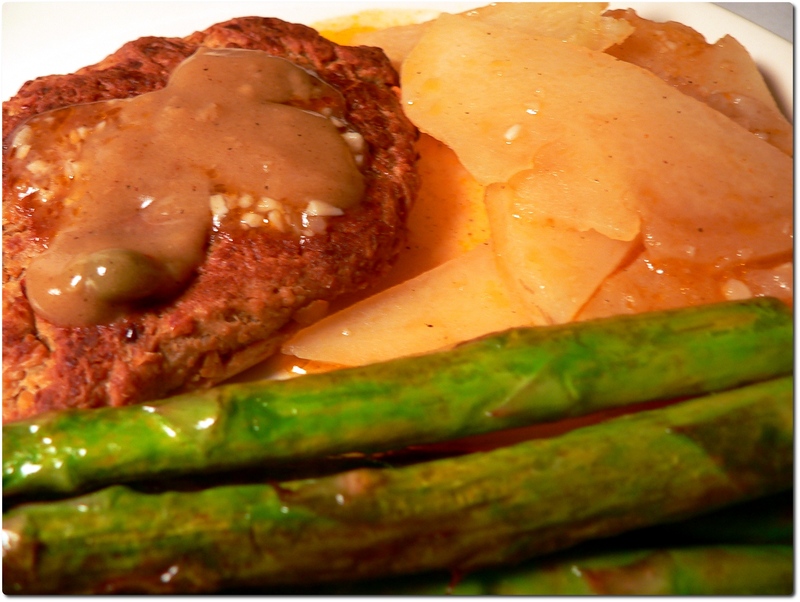 Serve with a sauce of your choice.